Bryce Canyon National Park was the 5th and last stop during our epic 2017 eclipse trip. While there we also visited near-by Red Canyon, in the Dixie National Forest, and Kodachrome Basin State Park. All three are located in Southern Utah not very far from the Arizona border. The major feature of the Bryce Canyon National Park is … Bryce Canyon, which despite its name, is not a canyon, but a collection of giant natural amphitheaters along the eastern side of the Paunsaugunt Plateau. I’m still going to call them canyons anyway because that’s what they look like to me. Call me a rebel. Before the four of us (Carol, Phil, Alexandra and Jim) pulled our Airstreams to Bryce Canyon, we took an interesting detour to the Hill Aerospace Museum located on the northwest corner of Hill Air Force Base, Utah, about five miles south of Ogden. If you like military aircraft and military history, this is the place for you! 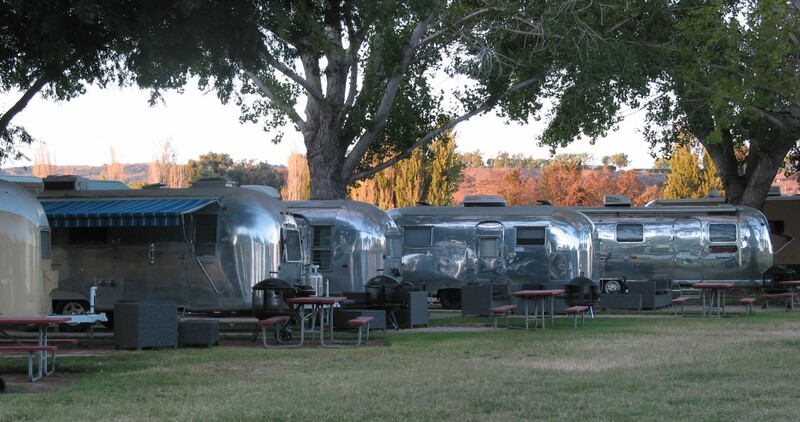 Lucky for us the parking lot is very large and easily accomodated our Airstreams. The museum was started in 1982 as part of the Air Force Heritage Program. It was opened to the public in 1987 and moved to its current location in 1991. There are two galleries, the Major General Rex A. Hadley Gallery and the Lindquist Stewart Fighter Gallery, that are housed in two huge buildings. There are more than 90 military aircraft, missiles and vehicles on the grounds both inside and outside of the buildings. Phil especially enjoyed the display of military aircraft from the Vietnam War. He was in the Marines at that time and worked on some of the aircraft models in the collection. He told me some interesting stories about the aircraft he supported. This is a great museum and a must see if you are in the area. Museum hours of operation are 9:00 a.m. until 4:30 p.m. Monday through Saturday and admission is free. We finally arrived at Bryce Canyon after spending several fascinating hours at the Hill Aerospace Museum and setup camp at Ruby’s Inn just outside of the park. Ruby’s is a huge place that features hotel rooms, a very large RV park, restaurants, stores and a gas station. It’s a great basecamp for exploring Bryce Canyon and the surrounding areas. There is one 17-mile road that runs the entire length of the main “canyon” area. Side roads lead to various viewpoints along the rim, all of which are simply amazing. Here’s where we stopped: Fairyland Point, Sunrise Point, Sunset Point, Inspiration Point, Bryce Point, Piracy Point, Farview Point, Natural Bridge, Agua Canyon, Ponderosa Canyon, Rainbow Point and Yovimpa Point. Carol, Alexandra and I also did an hour hike on the Rim Trail from the Inspiration Point area. Many of the viewpoints look down upon the same rock formations but look different because they are from a different angle. It was almost impossible to take a bad photograph at Bryce so here are a very few that we took in a slideshow from various locations. Because of prior commitments at home, Carol and Phil had to reluctantly leave after a couple of days. I’m sure they will revisit the area because there is so much to see and do. The same day they left, Alexandra and I packed in trips to Kodachrome Basin State Park, Bryce Canyon Mossy Cave and Red Canyon, which is a lot for one day. Our first stop of the day was at Kodachrome Basin State Park not far from Bryce Canyon National Park. This is a beautiful Utah State Park located off of Scenic Byway 12, one of the most picturesque drives in the West. The park features 70 rock spires (Hoodoos) ranging from six to 170 feet tall and unbelievable changing colors in the landscape. The colors prompted National Geographic, with permission from Kodak Film Corp., to name the park Kodachrome in 1949. Okay, okay, for those not my age Kodachrome was a color film for cameras that Kodak marketed starting in 1935. Kodachrome was very popular for professional photography and cinematography. It was discontinued in 2009 because of the popularity of digital cameras and because it was very expensive to process. Kodachrome color was famous in its day. You can’t get lost in the Kodachrome park since there is only one way in and one way out. There’s a really nice looking campground in Kodachrome. We didn’t stay in it but would certainly consider camping there in the future. They keep this park very clean. Of course we did see visitors that completely ignored the signs asking for folks to stay on the trails to protect sensitive areas. We drove the entire length of the park and did some hiking. The scenery was wonderful both from our truck and on the hiking trails. Here is a photographic summary of what we saw in Kodachrome Basin State Park. After Kodachrome, we stopped in a part of Bryce Canyon National Park that is away from the famous “canyon” area named Bryce Canyon Mossy Cave. Mossy Cave is in the northern section of the park located on Highway 12. The Mossy Cave itself is at the end of a short trail, about 1 mile, which wanders through hoodoos and windows (natural stone arches) and along a babbling creek. Mossy Cave with emerging cave dweller. This canyon looks like a Bryce Canyon kind of canyon with a stream running through it, but it’s not. Mormon pioneers dug an irrigation ditch, by hand, from the East Fork of the Sevier River, through the Paunsaugunt Plateau, into this canyon. That’s the babbling creek I mentioned above. It took them 2 years, from 1890-1892, to dig the ditch. This canal is known as the Tropic Ditch, and it supplies irrigation water to the communities of Tropic and Cannonville. It only took about an hour to explore the Mossy Cave area, but it was well worth it for the easy, scenic hike and for the history lesson we learned. Our last stop of the day was Red Canyon in the Dixie National Forest. Red Canyon is outside of Bryce Canyon National Park on Highway 12 and is surrounded by red sandstone rock spires and formations. It has a nickname of “most photographed place in Utah” believe it or not. The contrast between the red soil, red rocks and green pines is very striking. From the visitor center, one can’t miss the stone arch that Highway 12 goes through. You can’t help yourself, you have to take a picture of it. We hiked around, went through the visitor center, took a lot of pictures and then called it a day. Red Canyon is another place I recommend you visit if you are in the area and have the time. The major part of our last full day in Bryce Canyon was spent riding mules down to the floor of Bryce Canyon, through the Hoodoos. This is a must do adventure if you aren’t afraid of horses/mules and heights! As beautiful as Bryce is from the rim viewpoints, there is nothing like riding down into the Hoodoos for an up close and personal look. The ride starts from the stables located at the Bryce Canyon Lodge. We ate lunch at the Lodge a couple of days earlier with Carol and Phil and noticed an advertisement for the ride. Since we like to ride, we booked it. We’ve ridden many horses but never ridden mules. We requested mules if they were available and we were very happy when we got our mules. The ride started early in the morning, which is good because it can get warm. Beginning at Sunrise Point, we started the descent into the Canyon. Our guide was in high school, but he seemed much older and was very capable. He knew a lot about the history and geology of Bryce Canyon and narrated as we traveled. Some of the Hoodoo structures we saw were the Wall of Windows, The Chessmen, Silent City and the Queen’s Garden. Part of the ride also went through a patch of Bristle Cone Pine Trees. You have to see these things up close, they are amazing. Sadly, the next day we began the long trip home. We will certainly be coming back and when we do we’ll also visit Zion and Arches! Next Next post: Bighorn Sheep Rule Anza Borrego SP!